For me, it was a "scritch scritch" window screen sound on a morning when I finally thought I might be getting ahead of the stream of crises that seem to define my work-life every fall. I got up from my computer, strolled down the hallway, opened my bedroom door, did a double-take, screamed, slammed the door and let out a few "star words" (you know, the kind you put ** into when you write them in a public forum) ... there was a squirrel, a cute little red squirrel (think Beatrix Potter), on the INSIDE of my bedroom window screen, running up and down my curtains. My personal life experience (which I won't go into here since it involves a series of improbable tales that are frequently Monty Python-esque) actually includes more than one other story where a live squirrel has ended up inside our house, so I did possess the tools (live traps) and experience to meet the challenge. But when this particular rodent decided to make itself at home in my bedroom curtains, I didn't react calmly or heroically ... instead, I dissolved into a moment of pure panic and meltdown (as I'm writing this now, I'm really hoping that none of my neighbours were near enough to hear the ** words that came out quickly, colourfully and at a pretty good volume) ... and I was hit with the sudden realization (think cartoon hammer bonk to the head) that I was not coping with all the change and constant crisis nearly as well as I thought I was. Long story short: I pulled myself back together, set a trap, left the house to go to work, found solutions for a couple more crises, came home and (mercifully) found a small peanut-butter covered squirrel in the trap (and squirrel poop on my bed). In my younger years, this wouldn't have worn me out ... in my older (saner?) years, I was surprised at how much it knocked me back (I think I said "I'm getting too old for this star word"). 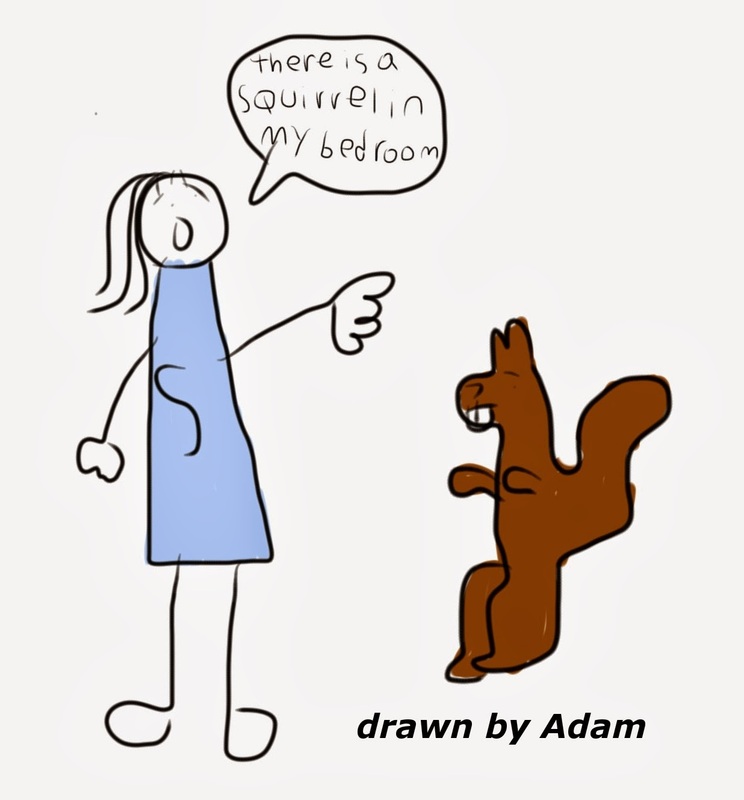 Still, good story (especially in the longer version with more detailed descriptions of the squirrel's moves and my counter-moves), so when I went to see Adam and his family the next day, I was looking forward to entertaining them with it. Only to have my story totally overshadowed by what had happened at Adam's house the previous day ... while I was chasing a squirrel, Beth (Adam's mom) was putting out a fire (a real one, in her kitchen, by herself ... she's so competitive). Adam is extremely particular about his food. He has a very limited diet, and will not eat any alternatives if his particular brand of a certain "approved" food is not available. Before lunch, Beth (his mom) discovered that they were out of his apple juice, so off to the store, which as luck would have it was out of his brand of juice that day. Quick trip home to drop off the groceries they had bought, with Beth's mind only on whether Adam could tolerate yet another unplanned trip to a second store to get the apple juice (needed for him to have the lunch he expected). Second store had the juice, Adam managed the trip, and the single thought in Beth's mind as they got to their front door was helping Adam keep his balance by getting him his lunch as quickly as possible. When they opened the front door, there was smoke coming from the kitchen. In situations like this, the human mind goes on auto-pilot. As Beth's mind quickly and automatically sifted through the list of priorities, getting Adam back on track (by making him lunch) still hit the top. 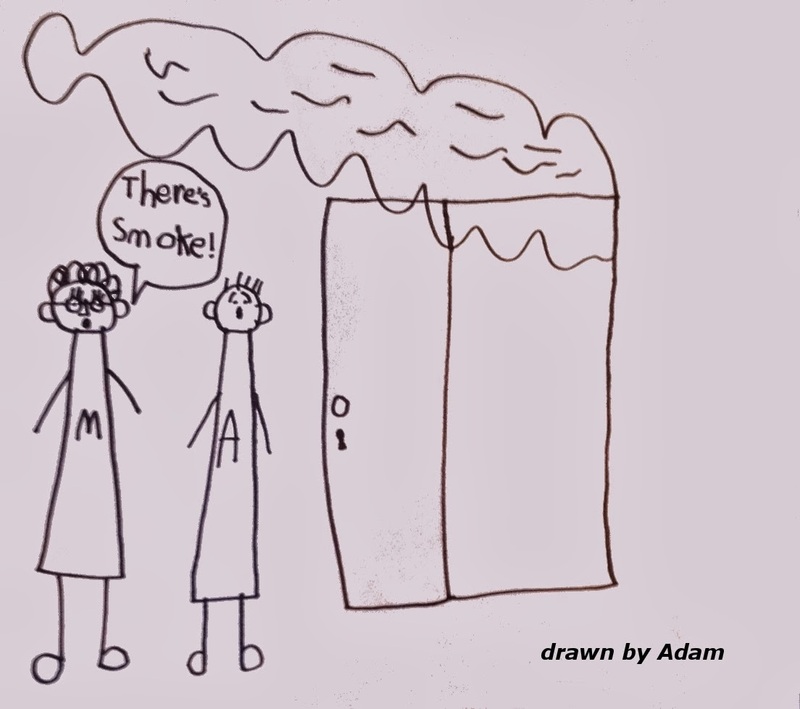 She told Adam not to worry, left him at the door and ran in to find that a stove burner on low had started a grocery box on fire. So what did she do? Scream? Cry? Run out? 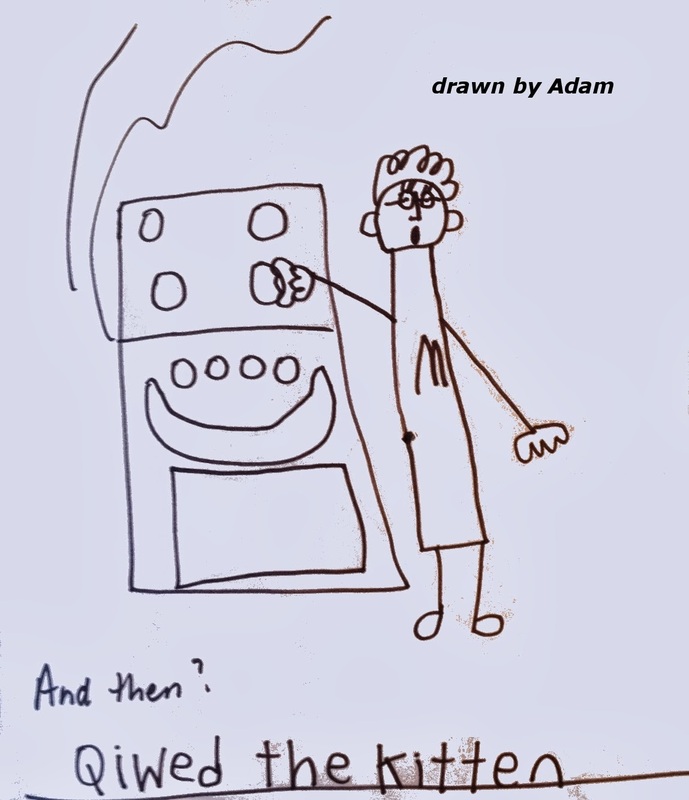 No .. in Adam's words (see below) she "cleaned the kitchen" .. no hysterics, no fuss, just coolly and calmly put out the fire. 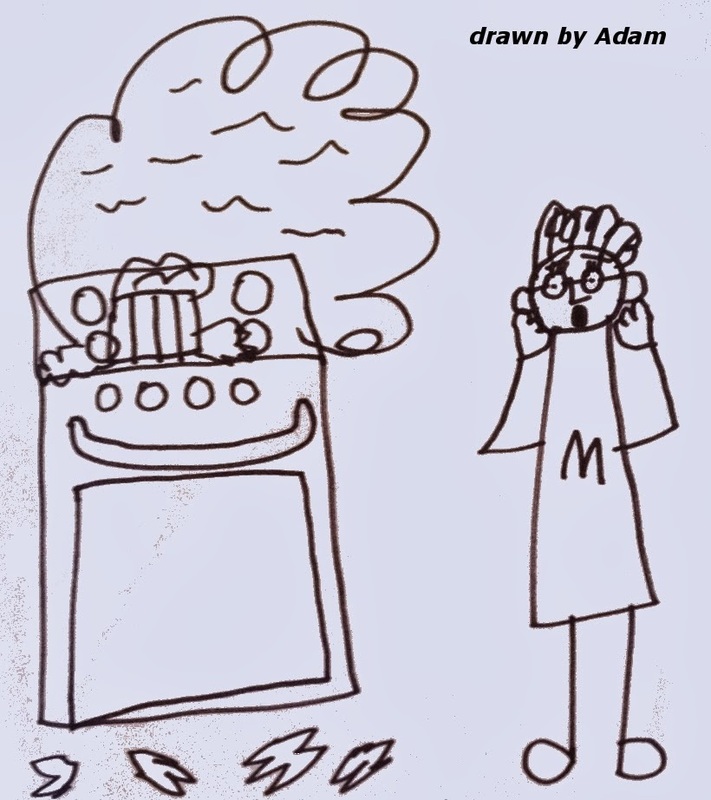 And even at this point, the fire didn't reach the top of the priority/panic list, other than as an obstacle to cooking Adam his lunch. The fire was not the tipping point, but the fact that the microwave and stove were now unusable could have been. Why? Because Adam has a narrow definition of what makes an acceptable lunch and all of the menu options require cooking. Fortunately for everyone, Adam decided that when your stove catches fire, toast is allowed for lunch - he ate at the kitchen counter and Beth cleaned up the rest of the fire mess (without the luxury of pitching a fit like I did when I first saw the squirrel). A few nights ago, I had a vivid dream about a zombie apocalypse. The zombie mayhem happened at a cocktail party, so prior to the attack I had been looking pretty spiffy. I had a "worst case scenario" outcome I guess, because my next conscious moment was rising from the dead as an undead zombie. My first thought was "hey, this isn't as bad as I feared it might be", followed quickly by "yay, what luck, I managed to keep hold of my sparkly bedazzled evening purse!" As my fellow undead and I gathered on the dance floor, I was extremely popular because my evening purse turned out to be full of lip gloss (tubes and tubes of it) which I shared around after realizing that getting a cold sore wasn't a problem anymore (and zombie lips really do need a little colour). Then I spotted my husband John, who had escaped becoming undead. For some reason he seemed terrified of me. Wanting to reassure him that I was okay and that being a zombie wasn't as bad as everyone had made out, I demonstrated to him (with giant scissors that suddenly appeared in my hand) how I could easily trim off damaged and decomposing body parts because my new body was like a plastic doll. I woke up with a strong feeling of surprise because it was obvious that my demo was not calming John down. While a mental health professional might have something to say about the underlying mix of thoughts and experiences that would cough up a night-time story of this nature, it was actually a very happy dream for me: the worst happened, I was changed but not defeated, and I even found a way to bring a little joy and colour back to the party. Win, win, win! Life has a habit of throwing surprises at us, and not all of them are positive or easy to deal with. When our lives include people on the autism spectrum, we have the extra challenge of supporting and shielding a person who doesn't do well with unexpected events, and it's easy to get into a state where your mental "panic button" is always partially engaged. My best suggestion is to embrace the craziness of life rather than fighting it. Find the humour, celebrate the absurd, and collect friends who do the same. When you tip over the edge, lie there for a minute, use some "star words", then get up and jump right back into the zombie apocalypse party. I love this. Must get some new lip gloss. I've got a sparkly purse full! !